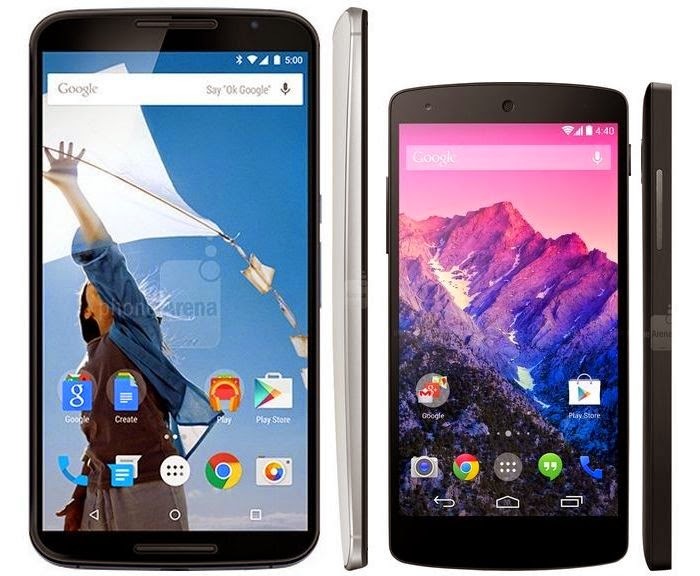 Nexus 6 is official since a short week, a comparison with the Nexus 5 is needed more than ever. First, because it is still relevant to compare the new model with the old one, because then the differences are perhaps more numerous than in previous years. We like it or not its format, we must admit that this year, Google has made ​​a big step forward by offering not an smartphone with compact dimensions characterized by a better value for money than the competition but a great Phablet 5.96 inches sold in the same price range as the latest high-end market entrant. 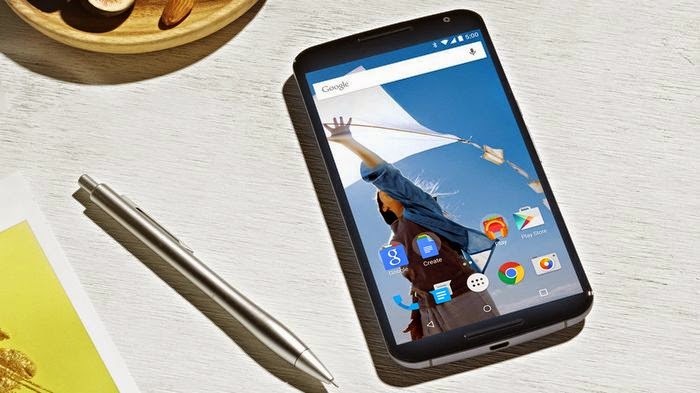 Like its predecessor, the Nexus 6 team is a Qualcomm processor of the latest generation. We pass and a quad core Snapdragon Soc 800 clocked at 2.3 GHz and supported by 2GB of Ram to 805 Snapdragon processor clocked at 2.7 GHz and associated with 3GB of RAM. An explosive combo which means both, higher performance, but especially the support of 4G LTE Category 6 which allows to push up rates to 300 Mbps against 150 Mbps for LTE Category 4 modem embedded in the processor Nexus 5. Of course, this is only interesting when you have a 4G + package. At the storage level, we pass two options each 16 and 32 GB of internal memory offering a minimum of 32 GB up to 64 GB for the Nexus 6. An essential improvement, especially when we know that no two devices no offers memory expansion slot. If the Nexus 5 was aligned with the high-end of last year with a 4.95 inch screen Full HD 1080p, the Nexus 6 almost anticipates trends with a Quad HD display of 2560 x 1440 pixels. A definition that only a few devices like the LG G3 or Galaxy Note 4 currently offer. Held against the size of the screen is now 5.96 inches, it was almost essential. Note that the final resolution does not change very little since going 441 pp for the model 2013-493 dpi for his successor. A difference that remain imperceptible. Finally, the display technology also changes happening because of an IPS LCD screen with AMOLED screen. In terms of quality, both are equal, however, the advantage here is that the AMOLED screens are more efficient because the pixels remain off when displaying black. It is also possible to see its notifications without turning the screen with the Ambient Display function. More Independence! 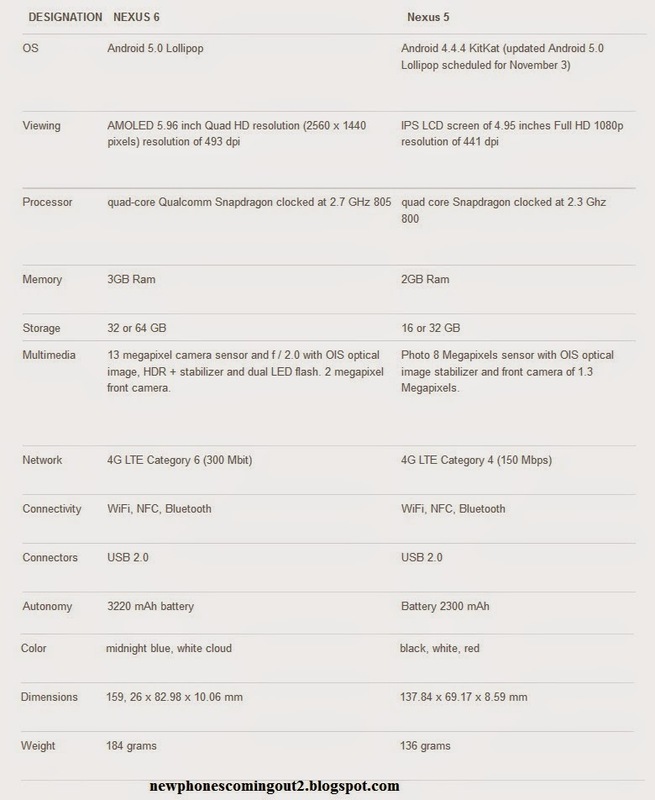 The resolution of the camera from 8 to 13 Megapixels, you can expect improvements. However, thanks to technology OIS optical stabilization implemented by LG, the photo sensor of the Nexus 5 already producing excellent results. 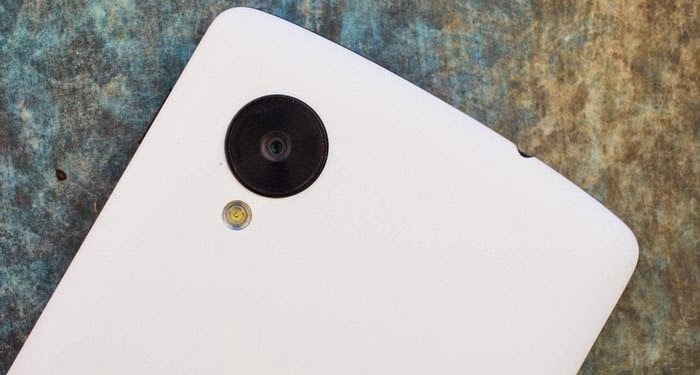 In addition, the new Android API Camera Lollipop will soon push further its performance by allowing him to film in a definition of 3264 x 2448 pixels at 30 frames per second. It is therefore very close to 4K resolution (3840 × 2160 pixels). The first tests of the photo sensor Nexus 6 revealed that he was doing quite well and had pictures characterized by a high level of detail. It remains to know what it is capable in low light but its dual LED flash should greatly help in this case. Due to its 2,300mAh battery, it has often criticized the Nexus 5 to provide autonomy, that could be called rough compared to its competitors. 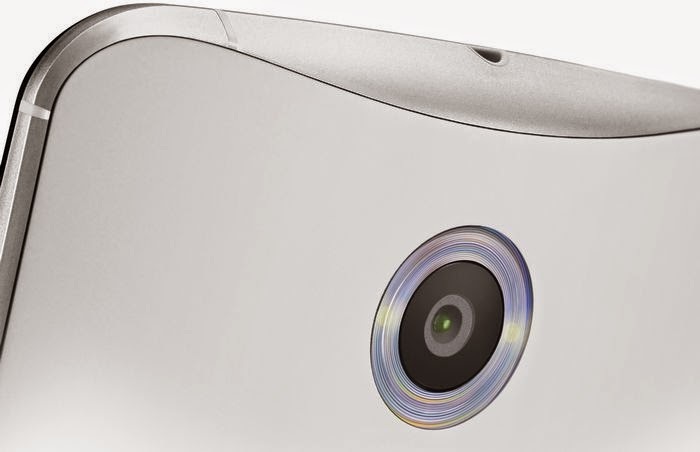 For its part, the Nexus 6 offers 3220 mAh battery. Capacity revised upwards but nevertheless essential in the presence of a Quad HD screen of 5.96 inches. In addition to providing a larger battery, the latest phone from Google team Technology quick recharge Motorola Turbo which will allow it to earn 6 hours of additional battery in just 15 minutes to load. Moreover, optimizations in Android 5.0 Lollipop-saving about 90 minutes of additional battery life. If you want to have the latest mobile technology available and its 5.96-inch large format does not bother you, then the Nexus 6 is for you. However, you will pay about 650 $ to be able to afford it. 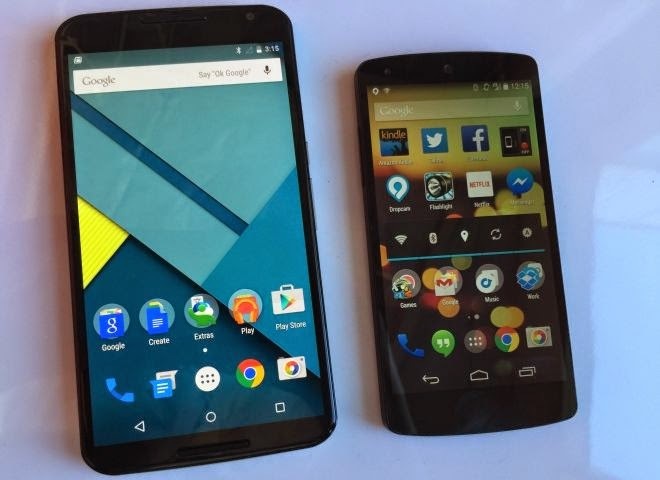 For its part, the Nexus 5 is still and always available in the Play Store at a price of 349 $. It is still very powerful despite its age a year. Moreover, its update to Android 5.0 Lollipop expected November 3 should allow him to stay in the game a little while.